They say that necessity is the mother of invention. Gerry recently got Hanger Jack to clean up all his cords in the garage. He likes getting them off the floor, and not worrying about tripping on them. Such a simple invention and yet so smart. 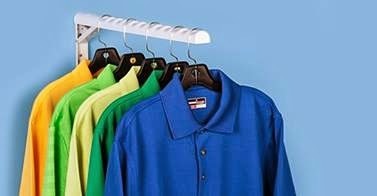 Easy to install, the Hanger Jack can be used as a hanging space when you need it, but it also folds away when you don't. It is great for those of us that are constantly using door knobs, doors and any crook and crannies they can as a hanging surface. Some great spaces for it are closets, laundry rooms and garages, or really any space that you need it in. It really is easy to install and a easy way to get things off the floor and surfaces and save some valuable space. Such an ingenious idea, that you wish that you thought of it!